Are you sick of not having a targeted, accurate list of relevant sales leads? 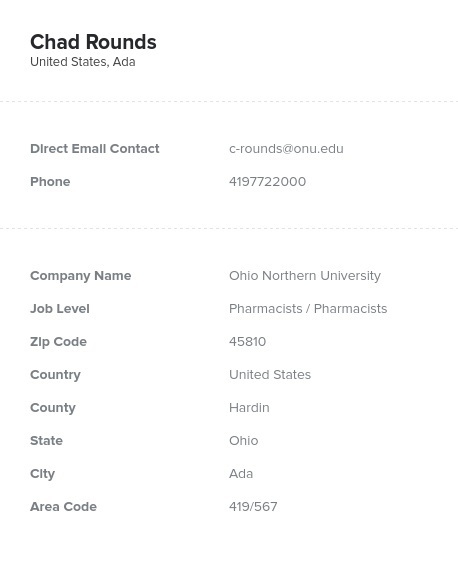 Bookyourdata.com has the prescription: a pharmacist database complete with the contact information of pharmacists spread throughout the US! Find pharmacists' email addresses, phone numbers, and direct contact information today. Conduct your B2B marketing campaign more efficiently by targeting a group of highly sought-after contacts. With this human-verified pharmacist database, you can conduct your pharmaceutical, medical, or software marketing campaign more efficiently. Pharmacists are health professionals who work hard to fill the prescriptions of patients with a variety of illnesses. They understand drug interactions, biochemistry, and how to help patients on a personal level. They often work both in hospitals and in retail settings. As health-care providers, they are very influential in the pharmaceutical world. This pharmacist mailing list consolidates this vast, diverse, and spread-out group of qualified medical professionals into one downloadable, easy-to-use directory. It contains all of the information you need to connect and is backed by our bounce-back guarantee. With this pharmacist email database, you can save money and time in your marketing efforts by getting in touch with your target demographic. You can then email leads that will hopefully lead to more sales! Buy our ready-to-download pharmacist email list or continue to customize a list that's unique to your business needs. This is one of our many pre-built databases, which means it's ready to download and integrate into your CRM right away. It's location-based; this list is specific to pharmacists working within the US. Thus, you'll know that this group is affected by common country-specific laws and policies. Download our database of pharmacists within the US today!